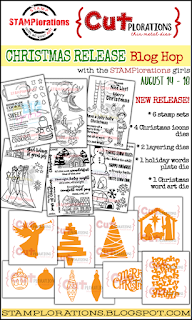 I am so delighted to be part of this fabulous new Christmas release from STAMPlorations. 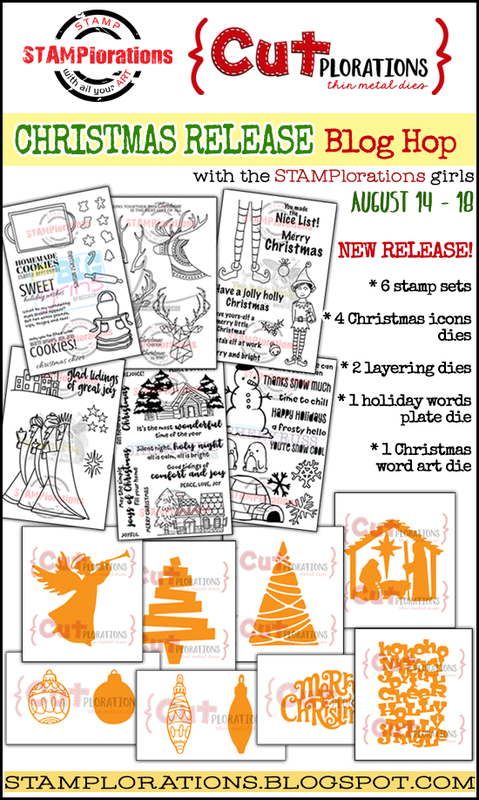 I have already been playing with those fun stamps by Becca Cruger for my Muse Christmas Visions post (by the way, there is still plenty of time to play along!). I stamped the cookie try and colored it and fuzzy cut it. Did some random stamping of the little "cookies" an my card stock base and colored them with markers. Added Stickles to some of them. Trimmed the card stock and mounted it onto red card stock. The tray is elevated with foam tape. Winners will be randomly drawn from all comments left on the STAMP blog and participating designers blogs - for more detail and the hop order, please visit the STAMPlorations Blog. Such a lovely card. I'm inspired. Love how you made that "patterned paper" look by stamping! So cute! Sweet is the operative word here. Charmingly sweet background and very sweetly used the cookie pan for your sentiment. SWEEEEET! I love the all over design (and one I am trying to work on!). Your card is adorable and so is this set. What a fun card. Some very good ideas you have here. I may just have to try them myself. What a colorful yummy card! What a fun and happy card full of X-mas joy! So cute with the cookie tray and the stamped background. Very "sweet" - pun intended! Very fun card! This is adorable!! Those little cookie stamps make a fabulous background. So festive. Beautifully stamped background. So adorable and sweet card! Those tiny little stockings and trees are the cutest ever! Love this fun idea! Bei dir ist es ja schon heftig weihnachtlich. Ich vermute mal, dass du dann im Dezember Sommerkarten bastelst. Diese Karte gefällt mir auch sehr gut. What else if there to say? So sweet. Love your card. Adorable card! Love the tray for the sentiment, and all those fun cookie shapes!